Jon and I have been thinking of what names we want for our future children and everything seems to start with "A". Because we have used "A" for Atticus already we feel that if we name the next child with an "A" name we will have to continue to use "A" names thereafter. I used to think that this was a silly idea but now I'm liking the unity and feeling of belonging it would bring to our family. I also really have always loved the structured look of the "A". 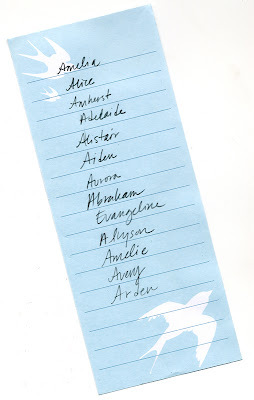 (oh and an "E" name slipped in there...but she could go by Angeline). Please comment with more names that you like that begin with "A". I'm open for ideas. Thanks! When I was pregnant with #3, several people asked us if we were going to do the "A-thing" for our children. No, we just happened to like those two names for our first two daughters. is justa s good as Evangeline. But then I am super partial to that one! oooh, thanks nadja! I love your name ideas! I actually forgot that I wanted to put Arielle and Antoinette on there too. I love those names and just might have to steal them ;). I have three children and one on the way - oldest daughter is named Accalia (from Roman mythology). i loved the A thing too. but i also like M names. not sure what to do next! but it looks like you're on to something.. .